The plot sounds so interesting as I love character studies. It book also sounds like there are some clever twits in the narrative. I put this on my wishlist ages ago, but it was somewhat lost under the weight of books added since, so thank you for such a lovely reminder. You’re very welcome, Jane. It so easy for books to get lost or forgotten about in that way. I’ve got 2 or 3 different wishlists, and they could do with a good clearout. I bought Madame de ___ last year, but it had slipped down the side of one of the bookcases, and I only found it again while looking for WIT Month reads! I hope you get a chance to read it at some stage as I think you would love it. So do I. It’s such a simple premise, but the reappearance of these earrings causes no end of trouble for all concerned. I love the cover as well. The Pushkin Press books are always beautifully designed, but I think they’ve excelled themselves here. I’ve just read it… and yes! Absolutely more melancholic than comedic; such sadness – although the jeweller did very well out of it all offering some chiaroscuro (could quite fancy a monologue version from his pov). I was quite taken with the biography given by Duff Cooper’s son too & I’d certainly read more from de Vilmorin. The film should be good as it was directed Max Ophüls, one of the leading directors of his day. I love his adaptation of Stefan Zweig’s story, Letter from an Unknown Woman. I’d like to see that too… such an intense & poignant story yet with creepy undertones. Just reread it this morning… still just as effective. It’s one of 4 in a Pushkin Press collection – as it’s translated by a women feels like it still fits the #WITMonth brief. Those Pushkin collections are lovely, they’ve done a great job in returning these writers to us. The film version of Letter from an Unknown Woman is well worth tracking down. Hope you enjoy! Sounds wonderful Jacqui – very much a case of what goes around, comes around! One to look out for! Definitely, Karen. It may seem as though I’ve revealed quite a lot of the plot here, but this is only the beginning. Those earrings keep passing in and out of the hands of M. de___’s jeweller. They start off as a symbol of love, a husband’s gift to his wife on the day after their wedding, but they end up symbolising something else entirely. It’s a very effective story. This sound wonderful, Jacqui. I’m impressed that you’ve entered a second round of #TBR20, too. Just this morning, I had resolved to start another #TBR20 myself and only use books I already own for upcoming book events. It seems like I need to quickly find this novella before I start. It sounds wonderfully melancholic, and and all because of a pair of earrings. The cover is quite beautiful, too. Thanks, Jacqui. Haha! Oh, do get hold of this little gem (sorry, couldn’t resist the pun) before you start your #TBR20. It’s quite affecting – as you say, very melancholic and beautifully written, too. The Pushkin Collection books are always beautifully designed, but this cover is one of my favourites. It’s simply perfect. It’s clever of you even to have found this! Years ago I was looking for Louise de Vilmorin and struggled to get books by her even in the original French! I had an anthology of bits and pieces by her but that was all. I may have to look this out – gorgeous review as always! Oh, wow – well, I can wholeheartedly recommend this one! 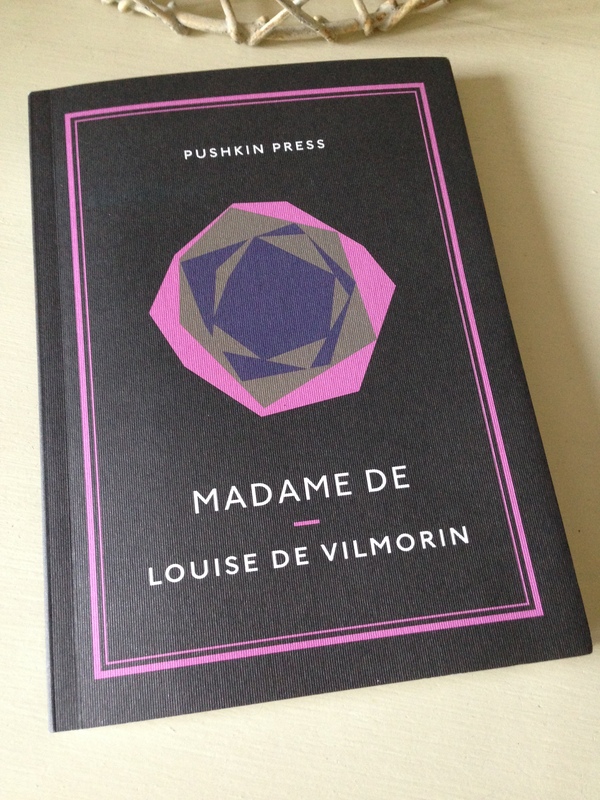 Louise de Vilmorin was completely new to me until I noticed Madame de___ in the Pushkin Press collection some time ago. I’d been considering it for a while but hadn’t seen a review anywhere, and then I noticed Scott had read it last year. He recommended it, and then Max also suggested it to me, so I knew it would be just my type of thing. I’d like to read more of her work as I loved the mood, the prose style and pretty much everything about this one. Was your anthology in French? I’m not sure if any of her other works are available in English. Yes, it was a French anthology. Pushkin are amazing, aren’t they, in the way they discover these lost gems? I will certainly look out for it! Ah, I thought it might be. Yes, Pushkin have been doing such a great job in returning these writers to us. I’ve got another two or three Pushkins sitting on my wishlist ready and waiting for the next round of book buying! Another post not received. WordPress must be buggy as I got the pingback. Glad you received the pingback, that’s something! Yes, I agree. Something about the context/milieu gives this story the feel of a 19th Century novel, and it’s there from the opening pages. I just realised this morning that all three of us have quoted the same passage in our reviews: the scene where she comes to question the nature of her life with M. de____. It really is one of the key moments in the story. Must get hold of a copy of the film as I’d been holding off until the review went up just to keep them separate in my mind. Love Max Ophüls’ Letter from an Unknown Woman, so I’m looking forward to seeing his interpretation of Madame de___. I have a copy here–yet to watch it. Shameful. Let me know what you think when you get a chance to watch it. This sounds great – I love the set-up. Couldn’t help but think of The Necklace. I think you may have sold this one to me! Hurrah! It’s a marvellous little story, Grant. I’m almost tempted to offer you a money-back guarantee on it! I haven’t read The Necklace – that’s a Guy de Maupassant story, right? An apt comparison as Madame de ___ could almost be a du Maupassant story, it’s very much in that style. Louise de Vilmorin is mentioned a lot in ‘The Horror of Love’ by Lisa Hilton, a non-fiction book about the relationship of Nancy Mitford and Gaston Palewski. She was apparently Gaston’s mistress, at one time. It’s worth reading, and there is a photo of Ms de Vilmorin, too. How interesting! I get the feeling she was quite a character. Thanks for the suggestion, I’ll take a look. Ooh. Duff Cooper. I’m very interested in him and the lovely Diana, and for a few years have slowly been reading his diaries. And I see you mentioned ‘The Horror of Love’ in a comment, which I have sitting on a shelf. I think I’ll have to add this novella to the mix. I’m glad you enjoyed the review – it’s a terrific little story, rather moving in its own way. Yes, Duff Cooper’s translation reads very smoothly, it all flows beautifully. I’d never come across Cooper before, but it seems he wrote Operation Heartbreak, a novel about an espionage operation in WW2. I may have to take a look. He sounds like a very interesting character, too! I was sure you’d enjoy this, Jacqui. It’s like some mischievous sprite climbed into a Maupassant story. I often think of this book in connection with Vivant Denon’s Point de Lendemain, though they’re actually quite different other than having a sly libertine at the center. The title is really one of the most perfect things – that hanging “de ____”. Loved it, Scott…all that heartache over a pair of evenings. I’ve only just started with de Maupassant, but Madame de ___ does seem to evoke a similar style. I don’t know if you noticed Grant’s comment, but the description of the set-up reminded him of Maupassant’s The Necklace. One for me to chase down at some point. Also, it’s funny you should mention Vivant Denon, as I have one of his novels (No Tomorrow) on the bookshelves at home. Looking forward to it immensely! I missed Grant’s comment, but yes, the set-up is a bit like “The Necklace.” de Maupassant has a number of stories with similar confusions. (No Tomorrow, by the way, is the title used for the translation of Point de Lendemain, a book even thinner in volume than Madame de___ but no less entertaining). Ah, so it is. I’m all set then! The set-up’s great, and it could have been a comedy, but it’s actually quite a melancholy little story! I’m fairly confident you’ll enjoy this one, Emma! It’s a great little story, quite affecting in its own way. As Guy has mentioned, it really does feel like a classic from the 19th Century. I’d love to read more by de Vilmorin, but there doesn’t seem to be much available in translation. I need to take a closer look. I have the Vivant Denon! (It’s published in English as No Tomorrow, so I hadn’t connected it with Point de lendemain until Scott pointed out the change in title.) Delighted to hear it comes with your endorsement, too. Funnily enough, Max recommended it to me last year, along with Madame de ____! Connections, connections…. I’m delighted you enjoyed it Jacqui, it is a good one. I agree that Emma would likely enjoy it too. I loved it, Max – thanks for the recommendation. Having reread your review, I completely agree with your comments on de Vilmorin’s skill as a writer. It’s quite uncanny how she manages to create such a rich picture in the mind of the reader when her descriptions of the characters are so economical. I’m sure I’ll enjoy the Denon, too – all the signs are very promising. This, as do so many of your choices, sounds great. However, after some recent splurging I need to do a TBR2000 or something to run down the insane amount of unread books on my shelves. I’ve a feeling I’ve seen the film – just checked it out and yes I have. It was good, although it was a long time ago that i saw it. Haha! And I thought I had a lot of unread books…I haven’t quite reached the thousands yet, but there’s still time. Madame de ___ is an absolute delight, and it would make the slimmest of additions to your TBR. ;-) Glad to hear you liked the film as it’s on my DVD rental list. It’s hard to go wrong with Max Ophüls, isn’t it? An excellent writeup, as usual. This sounds like just what I’m in the mood for at the moment — many thanks! Thanks, John. It’s a marvellous little story. I wondered if you might have seen the film adaptation directed by Max Ophüls. It’s on my list to watch. I have it on order from the library. Thank you. I’ll definitely take a look at that as I’m interested in de Vilmorin’s background. It seems as if she lived quite a life!